Welcome to the CBD. Take a look at all the glass masonry and asphalt. The streets are canyons. Apart from a tree in the footpath, or a Peregrine Falcon way overhead, there’s little nature to be seen. Nature is absent in these landscapes, or more correctly “hardscapes”. This runs counter to the trend to put urban people, and particularly children, back in touch with the natural world. Grass, flowers, birds, butterflies and worms are increasingly rare in a world of denser development. There’s no sense of season apart from flowers in street-side stalls. As much as five-sixths of our CBDs are buildings: asphalt dotted with street trees. The ratio of biomass to hard mass in such environments is minute. Trees help cool environments, while buildings increase heat absorption and reflection. This suggests cities are very poorly adapted to a projected 4-6°C global warming – a world where it may prove impractical to ever again grow large trees especially in hot pavements. Research is revealing that, although we may have left the savanna, it’s still a part of our wiring. Hospital patients who have a view of some sort of nature recover faster and need less medication. A recent article in Nature, “City living marks the brain”, points to a far higher incidence of mental illness in urban versus rural areas. Green exercise can act as a therapeutic intervention, which is doubly important in the hyper-dense environment envisaged by outspoken developers. However it’s not like that everywhere. In places such as Vancouver, setbacks are mandatory for high rises and view corridors have been preserved. Elsewhere, European and American cities have undertaken benchmark projects to soften the impact of roads. Hamburg and Madrid have roofed their inner autobahn/highway to create parklands. Portland tore down its waterfront freeway to do the same, as Seattle is currently doing. Other North American cities inspired by Michael Hough’s evocative book “Cities and Natural Processes” have returned rivers, ravines, swamps, and parkland to their natural state. 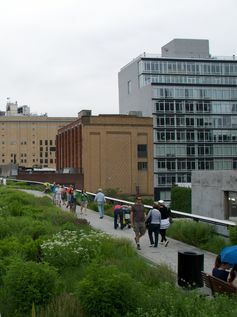 Then there’s New York City’s High-Line, a greenway for walking, running or simply sitting. San Francisco has its “parklets” and sidewalk gardens. In Melbourne virtually no public greenspace has been created within the grid proper since City Square in 1980, and even it has succumbed to the granite treatment and been chopped in half. Hardscape is on the rise with planning applications for more than 50,000 new apartments in 200 developments in and around the CBD. Few have recognised the “green-shift” now underway globally and recently embraced by Perth. It’s helpful for urban designers seeking a context to immerse themselves in the pre-white settlement setting. Proto-Melbourne would be unrecognisable: wattle in bloom, kangaroo grass, kookaburras and kingfishers along the river. Above where Queens Bridge now stands were The Falls, where clear freshwater cascaded; and to the west, amid a swamp with masses of water birds, lay a shimmering blue lagoon ringed by pigface. Each city has its own tale of what followed. Take a look at these two images of The Falls – this one at foundation and this one in 1857 – that’s an awful lot of trashing in just 22 years. Such squandered landscapes defy replication at their original scale but we can replicate them on a small scale. It is a matter of rethinking the user experience. Roof gardens (including food crops), green walls, plant-draped atriums, water features and borrowed scenery are ways of using interiors, walls, and ceilings. Buildings have long been in the front line of fighting climate change through “green building” rating systems. It’s time they were enlisted to reforge our linkages with a landscape that people have all but forgotten. The opportunities are highlighted by a design for a three sided hospital in Spain – one side is a green wall; another is solar panels in the colors of a butterfly about to go regionally extinct; and the third is a vertical farm that will feed people in the hospital. 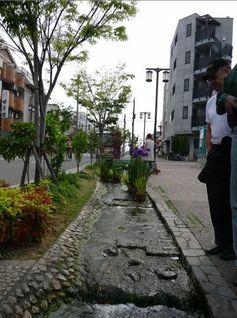 It is one example of the ways our cities can become truly green. This article written in collaboration with Dr. Peter Fisher was done as an unpaid work and is not part of any sponsored research project. Some of the ideas expressed in this article may appear in a recently published article: Naturizing outside-in: Reconnecting buildings with the natural world through a design innovation metric in the January 2013 issue of the Singapore based journal, CITYGREEN. Peter Fisher does not work for, consult to, own shares in or receive funding from any company or organisation that would benefit from this article, and has no relevant affiliations. This entry was posted in Healthy Cities, Healthy Cities Conference, Livable Cities, Liveable Cities, Making Cities Liveable Conference, Natural Resource Management, Population Growth, Sustainable Urban Development and tagged Central business district, D Trainham, Melbourne, Michael Hough, New York City, Peter Fisher, RMIT University. Bookmark the permalink.